Designed to help eliminate vibrations and noise that can travel through a mic stand, boom pole, or camera from reaching your shotgun microphone, the SHM-SOCAM Suspension Shockmount for Shotgun Microphones from Auray features heavy-duty elastic bands that help assure mic isolation as well as a secure fit. The shockmount will fit microphones between 0.75 and 1.2" (19 and 31 mm). The shockmount's angle is fully adjustable up or down, and is securely locked into place with the locking knob. It has a standard 5/8"-27 threaded adapter, and includes a a 3/8"-16 adapter for connecting to boom poles as well as a shoe-mount adapter for attaching to your DSLR or camcoder. 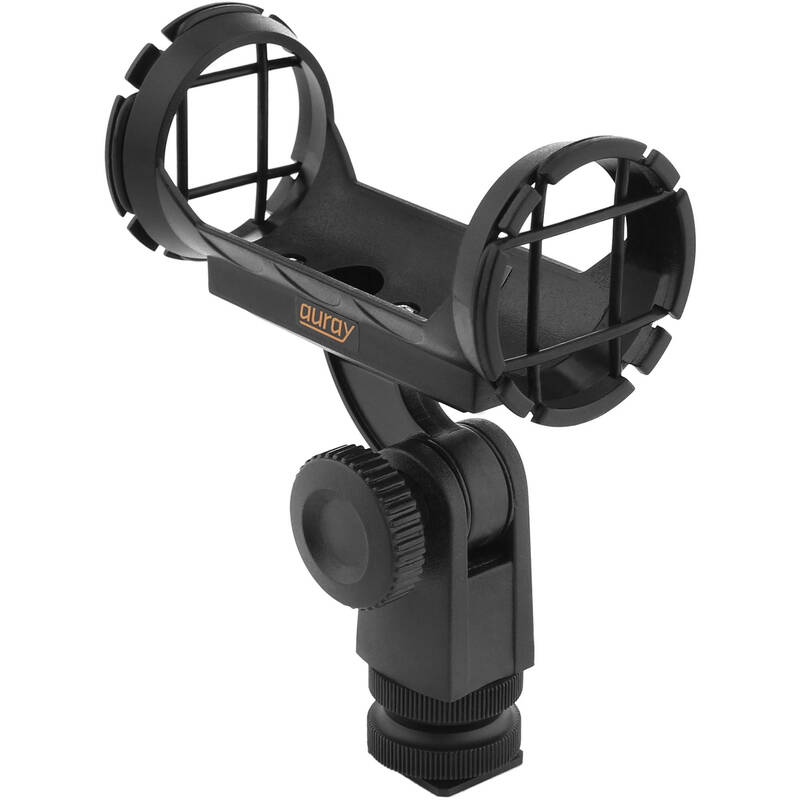 SHM-SOCAM Suspension Shockmount for Shotgun Microphones is rated 3.8 out of 5 by 6. Rated 1 out of 5 by Jack from Plastic junk. Threading easily stripped. To put this in perspective, I got a pair of Tascam condenser mics that included a hardshell case, 2 pop filters, 2 foam windscreens, and 2 shock mounts, all for $105 (also from B&H). And the 2 included shock mounts are built far better than this plastic junk. Main reason: the Tascam shock mounts have 5/8-27 brass inserts. This thing has plastic threading. Plastic threading isn't so bad when the threading is coarse. But mic stand threading is very fine, and the cheap plastic is easily stripped when removing/inserting the 5/8-3/8 adapter. Ended up throwing this away, and using one of the Tascam shock mounts on my camera. Rated 5 out of 5 by Keith from Nice and functional - holds well I've used this with my RODE NTG2 and AT4051a, both pretty small diameter mics. Great value. Rated 5 out of 5 by Anonymous from Great Had it for about 2 weeks now and it works great! looks like it will last a while and it does a great job of reducing sound generated by moving the boom pole. Rated 4 out of 5 by Michael from Does everything I need Does what it says. Holds my AT835 shotgun like I needed; haven't use it but a couple of times, but am very happy with it. Rated 3 out of 5 by MS from Does the job This shockmount isn't as sleek as other more expensive models, but it does the job just fine. Yes it is a good product but it may depend a lot on the type a size and weight of the shotgun you are using. For example I have attached another option for you that may be more suitable depending on your mic.